Radio King, Shaffie Weru, finally unveils the face of his baby mama after daughter turns 5. Shaffie Weru, a father of 2 daughters ever uploads images of his daughters but never of the woman behind his copyright. First daughter, Milan is a product of Shaffie and ex, Debbi Asila, while last daughter, Nia is a product of his other relationship with Joan Mwihaki. Last weekend, Shaffie with Joan and their daughter, Nia, visited the Sarova Whitesands hotel for a splash. Nia just turned 5, giving them a reason to celebrate the little one. 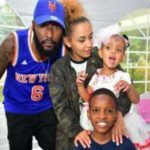 Shaffie shared the photos with baby mama, Joan and daughter, Nia, to his fans´ surprise and captioned: We must admit, Shaffie´s ride or die is a stunning beauty let alone her charming looks! Other daughter Shaffie´s first daughter, Milan, resides in California. July 2018, saw the media personality take a trip to California, to celebrate his daughter´s 13th birthday, which shows they too are tight. He captioned: 13 can be a tough age!!! You have to deal with bullies, strict parents, and puberty!!! Only dope thing at least you are growing up in the age of the Internet!!! Happy 13 One thing we identify the KISS 100 presenter is his ´partying´ skills that are always a hit. The post Radio King, Shaffie Weru shares rare photo of the breath-taking woman who gifted him his copyright daughter appeared first on Ghafla! Kenya.